Meet Gray, a lunar alien with a tongue as sharp as his wit. He's a little bit cute, a little bit evil, and a lotta bit bored. Having only read about the solar system his whole life, Gray decides the time has finally come to explore its wonders himself. He sets his sights on our blue planet, aiming to tour the scenery, meet the locals, and maybe conquer the globe while he's there. But the best laid schemes of mice and men often go awry, and aliens are no exception when Gray is forced to make a crash-landing. 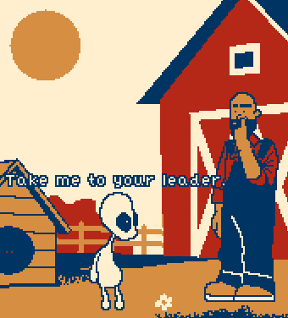 Guide him back to his UFO and away from the horrors of the rural countryside in Gray's self-titled traditional point-and-click adventure. Just try not to let him destroy any of the local woodland creatures, okay? Click the icons at the bottom of the screen to inspect, touch, and speak to your target, navigate through scenes, or access your inventory. Double-clicking the edge of the screen will allow you to transition to the next scene automatically, and the character's initially sluggish movements can be adjusted by increasing the "Speed" option within the menu indicated by the question mark icon. However, the developer cautions against altering this feature as it may cause certain audio and sound effects to go out of sync. Gray is something of a walking Wikipedia, and while some will enjoy his know-it-all recitations, others may find him much too chatty. You can press [esc] to skip cinematics or click to speed up those lengthy conversations, but doing the latter risks potentially missing vital clues. You'll be missing out on a lot of the fun too, as the humorous commentary encourages you to explore every option. Unless you're as clever as our bookworm protagonist, you'll likely have to resort more than once to the ham-fisted approach of smashing things together to see if the magic of adventure game logic creates something useful. The process of solving some of those puzzles can feel occasionally cumbersome when fumbling with the inventory window and picky click-detection. (I'm looking at you, moth!) However, solutions will come to you more easily once you start to get an understanding of what it is exactly the game wants you to do, and the smarty-pants feeling of success is as rewarding as its often comical outcomes. Everything from the snarky writing to the retro artwork is reminiscent of the classic adventure games of yore. What's more, Maciek Fitzner manages to take only a 4-color palette and paint a world that is vibrant and, at times, even beautiful. The length of the journey is relatively short, probably around an hour your first playthrough, yet feels more expansive as the world transitions from day to night. Gray may say he's antsy to escape, but if you enjoy black humor and colorful characters, you won't be in any hurry to leave. Select the icons at the lower left side of the screen to perform one of several actions. The footprints are used to navigate through scenes. The eyeball is used to inspect areas and the items in your inventory. The hand is used to touch and interact with objects or to pick up items. The mouth is used to speak with the target. Click the backslash icon to access your inventory. You can also use the right mouse button to cycle through these actions or press [Tab] to open the inventory. Double clicking at the edges of the screen will cause Gray to transition to the next scene automatically. Additionally, you can control your character using the left and right [arrow] keys. There are four icons at the lower right side of the screen that perform a different set of functions. Click the hammer icon to open the game save menu. Click the speech icon to open the load save menu. Click the X-shaped icon to quit the game. Click the question mark icon to open the options window, where you can adjust the game's settings. Talk to the farmer and select the following conversation options. "Your hand appears to suffer from ADHD." "I will inform you when I have found a suitable item." The farmer will task you with finding an object to keep his hands busy. "Would you be so kind as to... go away?" "It's been a PLEASURE talking to you." During your conversation, the sun will move backwards in protest, positioning itself just above the doghouse. Pick up the FLOWER on the ground between the doghouse and the farmer's feet. Walk right to enter the next scene. Click the smoking cigarette on the ground to try to pick it up. A bee will come and land on the cigarette, blocking you from grabbing the item. Show the FLOWER to the bee to distract it and then pick up the CIGARETTE from the floor. Go left to return to the farm. Give the CIGARETTE to the fidgety farmer. The farmer will smoke the cigarette and blow smoke into the air. If the sun is correctly positioned above the doghouse from your earlier conversation, the farmer's smoke will chase the sun away and change the time of day from morning to late afternoon. "You seem agitated and restless." "As you Earthlings like to say: see you again, my dear caiman!" Now you can go about finding the thirsty farmer something to drink. Move right twice to reach the orchard. If you've spoken to the farmer, a bird will be waiting for you here. Talk to the bird to learn that it wants you to bring it something shiny and golden. Offer the CORN from your inventory to the bird. This magpie seems to have expensive tastes, so you'll have to bring him something better. After Gray chases away the bird, pick up the APPLE that falls to the ground. Go back to the farm. Give the APPLE from the orchard to the farmer. Once the farmer runs away, pick up the APPLE he leaves on the ground. You also receive the TOOTH left behind in the apple. "I wanted to ask you this: Don't you wish you were free, sometimes? Like a bird!" "Yes! And your greatest feat to date!" Now leave the scene from either side and then return to make the bird reappear. Show the TOOTH to the bird. When Gray scares it off this time, it will leave behind a BLACK FEATHER. Walk left twice to travel to the farm. Attempt to talk to the chicken to make your character approach it. Feed the CORN from your inventory to Brutus. After Brutus is incapacitated, search inside her doghouse to find the GOLDEN EGG. Move one screen to the right to reach the beehive. As you walk to the right side of the screen, one of the bees will chase after you and prevent you from leaving. Stand still until the bee lands on your character. After the bee stings Gray, its STINGER will be added to your inventory. When Gray puffs up, use the APPLE on him to bring him back to normal. Continue right to the orchard. Give the GOLDEN EGG to the magpie. After a brief cinematic, the time of day will transition to sunset. Walk right twice to travel to the lake. "Droopy, blood shot eyes... Pale skin... Muffled speech... You need sleep!" "Let's just call it a day, shall we?" Now the sun has tasked you with finding it a puffy pillow to sleep on. Pick up the RIVER CANE on the left side of the gap between the two sections of grass. Combine the STINGER and the RIVER CANE in your inventory to create the BLOWGUN. First, attempt to use the BLOWGUN on the cloud in the sky. Gray will advise you to try from a different perspective. Use the hand tool on the ladder to climb up into the tree. Use the BLOWGUN on the cloud again to shoot it down. After a brief cinematic, the DEFLATED CLOUD and the STICK will be added to your inventory. Walk left twice to the farm. The farmer will talk to you when you enter the scene, then leave to go hunting. Pick up the WHITE FEATHER that Brutus leaves behind on the ground, in front of the left side of the dog house. Go back to the orchard. Take the TERMITES crawling over the far left side of the fence. These will only appear after the farmer has left the farm to go hunting. Continue right to the forest. Place the TERMITES on the right tree trunk. This will cause the woodpecker to jump to the right tree and peck at it, which will disorient the spider. Grab the SPIDER to add it to your inventory. Combine the SPIDER and the STICK to create a makeshift NET. Move left twice to go to the beehive. Select the NET from your inventory, then use it to catch the MOTH flying in the air. It may take a few tries to hit it just right. After the short cut-scene, pick up the GOOSE and the PILE OF FEATHERS that fall from the sky. Combine the WHITE FEATHER, BLACK FEATHER, and PILE OF FEATHERS with the DEFLATED CLOUD in your inventory to create the FLUFFY CLOUD. Give the FLUFFY CLOUD to the sun. After the cinematic, the time will transition to night. Walk to the right to reach the campsite. Use the hand tool on the "No Camping" sign to remove it. Pick up the EMPTY JAR and the KNIFE on the ground. Once the area is cleared, the UFO will land in the open field. Move left twice to reach the forest. Collect the fireflies in the air with the EMPTY JAR, making it JAR WITH FIREFLIES. Use the KNIFE on the JAR WITH FIREFLIES to poke some air holes in the lid. 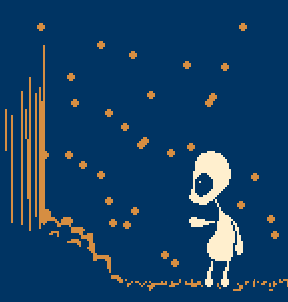 Be careful not to walk to another scene without putting air holes in the jar, or the poor fireflies will suffocate, and you'll have to come back to collect new ones. Place the JAR WITH FIREFLIES inside the bottom of the spaceship. Use the hand tool on the ladder to enter the UFO. Examine the fuel tank to find that it's still missing a little fuel. Open the glovebox and take the LIGHTSABER inside. Exit the spaceship by clicking the door icon at the upper right corner, then continue left to the lake. Use the LIGHTSABER on the grass to silence the frogs and reveal the moon. Use the MOTH on the moon to release it. With the light from the moon, you can now walk left to the Forest. Give the GOOSE to the creature with the glowing eye in the middle of the darkness. Try to pick up the moth at the lower left corner of the screen. Take the uncovered WATCH left behind on the ground where the moth was. Go back to the campsite. Place the WATCH at the bottom of the UFO to completely fill the fuel tank. Climb the ladder to enter the spaceship. Examine the sliders on the navigation panel and the buttons of the speed meter. Adjust them both to correct settings to prepare for takeoff. First set the navigation sliders so that the Y slider is at the top, the Z slider is at the middle, and the X slider is at the bottom. To do this, you only need to click the Y slider once (assuming you haven't touched any of the other sliders yet). 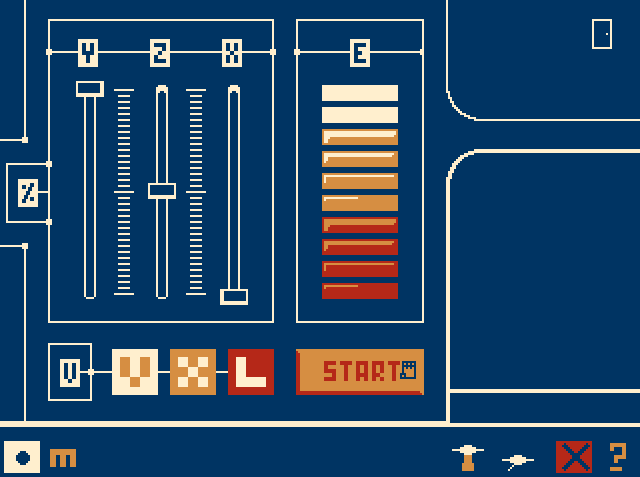 Next, set the speed meter buttons to create an equation using Roman numerals that equals a total of 250. Change the first button to 5(the Roman numeral for V), the second button to X (for multiplication), and the third button to L(the Roman numeral for 50). 5 x 50 = 250. Press the START button to launch the UFO. Wow, You did one hell of a good job with the walkthrough! Very thorough and cohesive. As far as Gray's sluggish tempo is concerned, you can always just double-click on the left/right edge of the screen to skip right to the next location (I seriously would've gone crazy without that function while testing the game, hehehe). Also, you can switch between LOOK/GRAB/WALK with the right key and hit TAB for quick access to the inventory. Interesting. I ran the entire game on the maximum speed and didn't encounter any issues. Allow me to clarify, I actually mentioned it in the way that I had because I found his pacing within the scene a little too slow, rather than how he navigated between scenes which (as you mentioned) is easily skipped. And I don't know who wouldn't enjoy the walking animation! It's very cute. Hey, just thought I'd drop by to say the game got updated to E3 version (Easter Egg Edition, that is, not the Electronic Entertainment Expo) - which features an optional Easter Egg mode, including new locations (some of which Gray can die in, even! ), new inventory objects and some other little modifications (including surprising ways to die). Check the game's GameJolt profile/news for details. Have fun!